The detective theme - a blueprint that’s commonly offered beyond the walls of many an escape room company across the country. Our time at the Southend branch of the franchise kicked off to a great start upon meeting the affable and welcoming Fran, who after exchanging pleasantries, gave us the low-down on the games rules and regulations before enthusiastically retelling its plot. 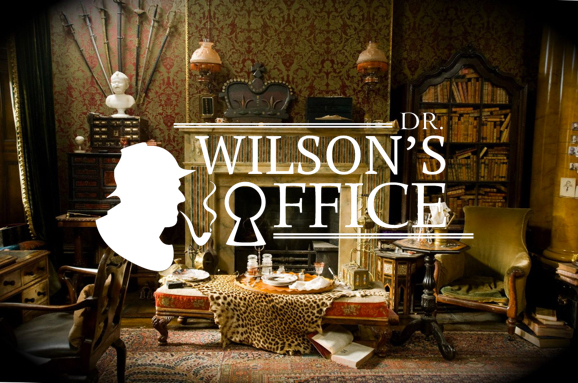 Dr Wilson is a master detective who has solved many crimes in his distinguished career. But this particular case could prove to be deadly for him. One of the suspects he is investigating is threatening his life and Dr Wilson was now relying on us to unveil his identity. Fran escorted us to the room, locking us in where our 60 minute countdown began. The room was decorated to a high standard convincingly transporting us to the detectives study. The furnishings befitted the period, evoking stereotypical connotations of a Sherlock Holmes-esque space. Burgundy baroque wallpaper and mahogany furnishings, including a writers desk with antique curiosities and a clichéd deerstalker accessory or two all featured heavily here. There was much to investigate - our favourite type of room to play. There was plenty to do with lots of nooks to consider, including a few interesting hiding places! This allowed for each player to simultaneously undertake separate tasks before regrouping to share our finds. The room was a good size, confined enough for duos not to feel overwhelmed but large enough to accommodate bigger groups who could manoeuvre the space comfortably. The puzzles kept in line with the rooms theming and were varied in their complexity, included multiple styles of locks to crack which further strengthened it’s enjoyability when progressing in the game. It’s worth highlighting the rooms use of audio which started as melancholic background music complimenting it's theme. But as the clock continued to countdown the pace and volume intensified, subconsciously supplementing our pressure to escape - a nice touch we though, given that we’d yet to experience this easily implemented addition elsewhere. Another positive was the involvement of Fran as our games master. The provider of clues and assistance if needed. We particularly liked the fact Fran, who was watching from outside, refused to provide a clue when she could see we was very close to a resolve. This attention to detail (akin to our earlier experience with this company’s Room 13) felt that Fran was actually invested in our game, observing our movements closely rather than generically pushing through clues when asked. This, along with that eventual eureka moment really strengthened the sense of achievement in our gameplay here. Having eventually uncovered the identity of Dr Wilson’s suspect and finally escaping in good time Fran was ready to congratulate us with a beaming smile on our exit. Reaffirming our sense of accomplishment and our “Uncontainables” namesake! 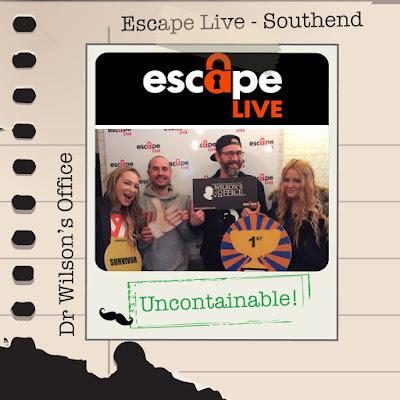 Despite our unfounded reservations about yet another detective room, Dr Wilson’s Office proved to be a well thought-out, satisfying and enjoyable sixty minutes. Going forward we’ve learnt to make our own line of enquiries before being dismissive of commonplace themes, as Dr Wilson’s Office turned out to be anything but a case of the usual suspects.